I try to pre-wash my fabric and get it neatly into my stash as soon as possible. On Friday, I got my first Patchwork City BOM kit, the rest of the fabric I need for my king sized ninja quilt, and I picked up some other odds and ends. 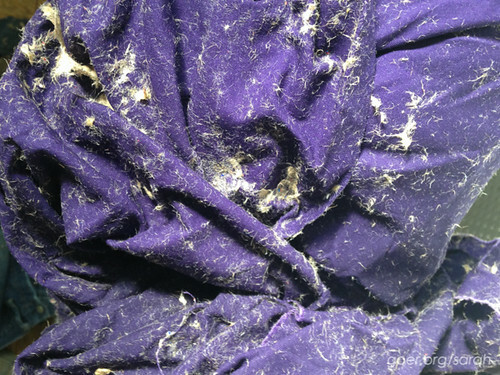 As always, there was some other fabric around here that I hadn't yet pre-washed. So the last couple days have been spent pre-washing and ironing. The washing end is in sight (there's still a healthy pile of ironing left!) and this morning I put in one of the last groups of fabrics, including some Cotton & Steel Viewfinders, some lovely Alison Glass Sun Prints, and some solid purple yardage. Darks. So I threw in a couple color catchers. Then I started up the washer and went about my morning. A *few* more color catchers than needed. Now I'm pretty sure when a small cardboard box disintegrates into wet cardboard dust, it results in about a million little brown specks... so yeah, they weren't exactly coming off real easily. 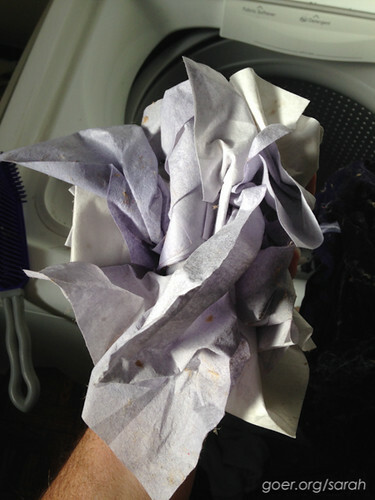 So I shook the fabric around and kinda dusted it off with my hand as best I could and start loading it into the dryer. Then I had to babysit the dryer so I could empty the lint trap when it filled up, about every 4 minutes. At least this mostly took care of the problem and a second wash and dry seems to have left all my fabric looking like new again. You non-pre-washers are pointing and laughing now, aren't you? See that... stuff... that used to be a cardboard box. In summary, here's my pro tip: Don't put the entire box of Color Catchers in the wash.
Posted in Fabric on February 4, 2015 by sarah. I hate it when I leave Kleenex in a pocket and it gunks everything up. Frustrating!! But you did tell a funny story so thank you for the chuckle!! Oh, darn, you're human! Who knew? Oh no, Fawn! That sounds horrible! I confess when I saw the blurb and photo in my blog reader I was terrified that you'd had dye run and ruined all your fabric! So I'm glad it was a humorous story instead. Not the same thing, but we have wool dryer balls that we will put a drop or two of essential oil on and my husband once threw the bottle of essential oil in the dryer - that was a smelly load of laundry! And that's why I have a front load washer. Nothing can ever fall in! And thank God for the lint trap on a drier!! This is a funny post.... Made me smile. Especially since at the beginning I thought you were going to have a fabric dye issue. This was a mess but worked out ok. Glad nothing was actually ruined.